Jennifer Aniston lauds the benefits of Aveeno, Bud Light shows off beer at a concert, and Secret sells its freshly scented deodorant. Pretty standard commercials, but what's different is the content that comes after. In this case, they're all followed by ISIS and jihadi videos. Terrorism analyst Mubin Shaikh said one video is part of an ongoing propaganda series that ISIS produces and another is a jihadi-themed video. Video sites like YouTube sell ad time to companies, and the ads get automatically inserted before the videos play. Advertisers don't directly control where their ads are placed although they can specify the demographics they'd like to target. "From a contract perspective, these corporations that are paying lots of money to get YouTube clicks may not be that pleased when they find out that their video is placed right before an ISIS recruitment video," legal analyst Danny Cevallos said. Though some videos may not violate YouTube's policy against inciting violence, they might not be appropriate for advertising. It's almost impossible to know how many companies' ads have run before videos like this, but at least two companies were unhappy with the content pairing. "We were unaware that one of our ads ran in conjunction with this video," a vice president of consumer connections at Anheuser-Busch (AHBIF) told CNNMoney after reviewing one of the videos that played one of its ads. "We have strict guidelines with our media partners that govern when and how our ads appear. We are working with YouTube and our media buying agency, Mediacom, to understand and rectify the matter." "Our ads should not have appeared and we're working with YouTube to understand how it happened and to avoid it happening again," said Paul Fox, director of corporate communications at Procter & Gamble (PG). Johnson & Johnson (JNJ) did not respond to CNNMoney's request for comment. An industry analyst says YouTube would make around $10 per thousand clicks on these types of ads. 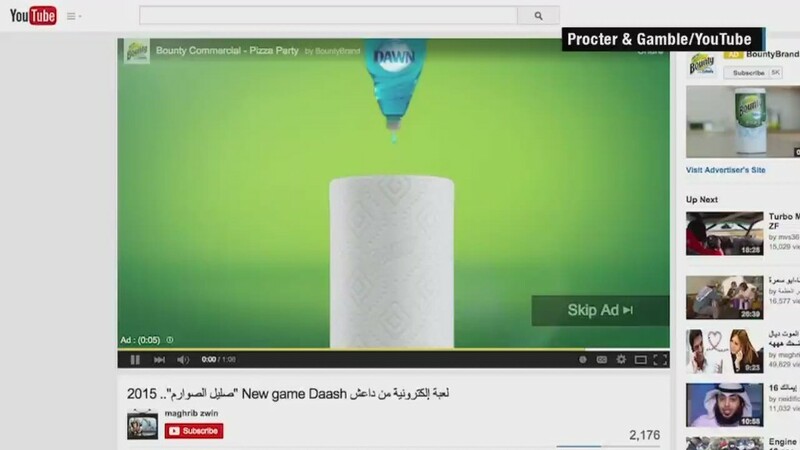 A person familiar with YouTube's business model says the company didn't make money from these specific ads. If they had, profits would have have been sent back to the advertisers. YouTube says it removes any content that incites violence and is careful about placing ads. "We also have stringent advertising guidelines, and work to prevent ads appearing against any video, channel or page once we determine that the content is not appropriate for our advertising partner," a spokesperson for YouTube said. Regardless of stringent advertising guidelines, YouTube relies heavily on its community to flag content. With 300 hours of content a minute uploaded, some may fall through the cracks. Since CNNMoney reached out, the ISIS related video has been taken down. The other video remains online but ads have been removed.